EXCLUSIVE: Metro said this tunnel would open in 2016. Why is it still closed? 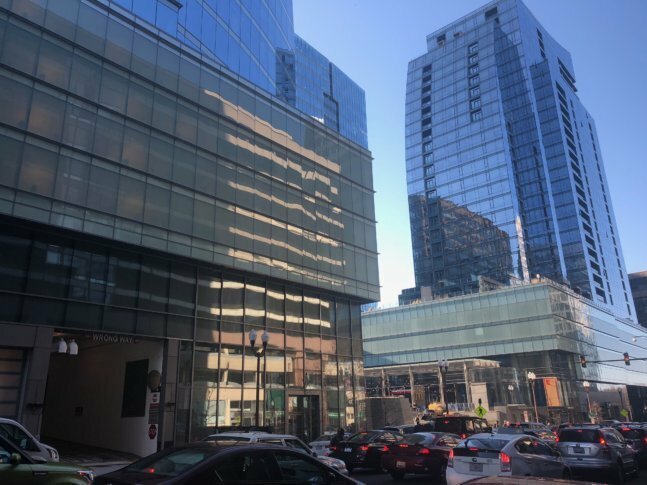 The street-level tunnel through a glitzy new building — directly across from the Rosslyn Metro station entrance — would significantly speed up bus trips. ARLINGTON, Va. — A bus tunnel in Rosslyn critical to many commuters — which Metro said more than a year ago would open in days — remains closed due to outstanding construction concerns, WTOP has learned. The street-level tunnel through a glitzy new building, directly across from the Rosslyn Metro station entrance, is supposed to replace an alley that the building was constructed over. Metrobuses used the alley to significantly speed up trips by cutting directly from North Moore Street to North Lynn Street for a direct connection to Lee Highway, Interstate 66 and the Key Bridge. Instead, Metrobuses and Arlington’s ART buses have had to loop around onto Wilson Boulevard and other roads, adding to traffic delays and operational costs, ever since construction ramped up several years ago. “WMATA has not accepted the bus tunnel as there are outstanding issues and, as such, the project is not completed,” Metro spokeswoman Sherri Ly said. Neither Metro nor JBG SMITH, the developer responsible for building the tunnel, would say precisely what the remaining issues are or whether Metro is being compensated for delays in the project. “JBG SMITH and WMATA have been working collaboratively on the Central Place project for over a decade. We are long-term partners with WMATA and look forward to the successful completion of this project,” said a brief emailed statement attributed to Senior Vice President of Development Matt Ginivan. While that suggested ongoing negotiations or other work, Ly said Metro had “nothing further to provide” about the specific problems, any efforts to find solutions, or any timeline for the tunnel to open. Metro had announced in early December 2016 that the tunnel would open a few weeks later, and that riders would start seeing faster trips on Dec. 18, 2016. Until now, no updated information has been provided — even in response to past questions — about the tunnel’s continued closure. According to the Arlington County Department of Environmental Services, JBG SMITH must finish a “punch list” of tasks before Metro will eventually accept the tunnel and open it to Metrobus and ART routes. The county does not have a direct role in the opening of the pass-through tunnel, a department spokesman said. Cones that had blocked the entrance over the past few weeks were recently removed. County site plans for the $289 million Central Place residential and office towers approved in 2007 promised that the bus pass-through in the office tower would comply with all of Metro’s standards and local building codes to allow all types of buses to safely use it. “Final design of the pass-through, including height, slope, dimensions, ventilation, and lighting shall be coordinated with WMATA and Arlington County,” the plan adopted by the Arlington County Board said. The plan also called for some type of audio or visual warning to people walking around the bus pass-through entrance that buses are entering from Moore or exiting onto Lynn. The flashing yellow lights and high-pitched beeps already activate to warn of cars leaving the office building’s garage just a few feet away from the tunnel entrance on Moore. “The applicant is in coordination with WMATA to provide a bus alley through the proposed building that meets the requirements of WMATA,” Arlington County staff wrote at the time. The tunnel would significantly speed up commutes for thousands of bus riders, drivers and pedestrians, the Rosslyn Business Improvement District said, because it will allow Arlington County to better sync traffic signals for people walking, driving or on buses and dramatically reduce the number of buses circling the area around the Metro station multiple times. “As a result, this project should help improve traffic issues in one of the busiest parts of Rosslyn,” the business improvement district said in a statement to WTOP. For bus riders alone, the change could save five minutes or more at rush hour on some trips. The issues are reminiscent of the Silver Spring Transit Center project. It was not built by Metro but had to be completed to its and Montgomery County’s specifications before the transit agency would accept the project, which created years of delays. Eventually, lawsuits over flawed concrete and related structural issues led to a prolonged legal battle.